The teaching staff are supported by teaching assistants, working across the classes. Reception children are also supported in the mornings by Mrs Foster, Mrs Stephens, Mrs Begum and Mrs Murphy. The school day begins at 8.40. It is important that you get your child to school on time so that they can enter school with their class. Your child may come to breakfast club for free this half term. The school day finishes at 3:00pm children will need to be collected at this time. Your child must wear the correct school uniform, with sensible black school shoes. School uniform consists of a bottle green jumper or cardigan, grey trousers or skirt and a plain white shirt. The correct PE kit must also be worn – white polo shirt (no sports tops) and plain black bottoms. The children will have P.E on Wednesdays. Please ensure you write your child’s name on all uniform and PE kit. Please bring a bag of spare clothes (including underwear) to school for your child and leave it on their peg. The children will be learning in the classroom and outdoors throughout the day. Please ensure they have a coat, hat, gloves and a scarf and if possible please bring some wellingtons into school for your child. Please ensure names are written on all clothes. Homework is given out on Fridays and needs to be handed back in on Tuesdays. The children will have Maths, Literacy and Talk homework. Before half term they will start having Home Reader Books sent home every Wednesday. Please use the link below to Bug Club using the password you were given for your child at the reading workshop to read more with your child. The children will also borrow books from the library each week. You can change the books with your child 8.40 on their library day. Each week the class teachers will send home the class mascot with a child to encourage them to talk about what they do at home with their family. The children are able to choose activities during their child initiated time which help them to develop fine motor and gross motor control, problem solving, self-evaluation, social and language skills, independence, the development of ideas though enquiry and the extension of thought processes. We want the children to take responsibility for their own learning and enjoy it! The children’s homework will be linked to topics the children learn about in class. 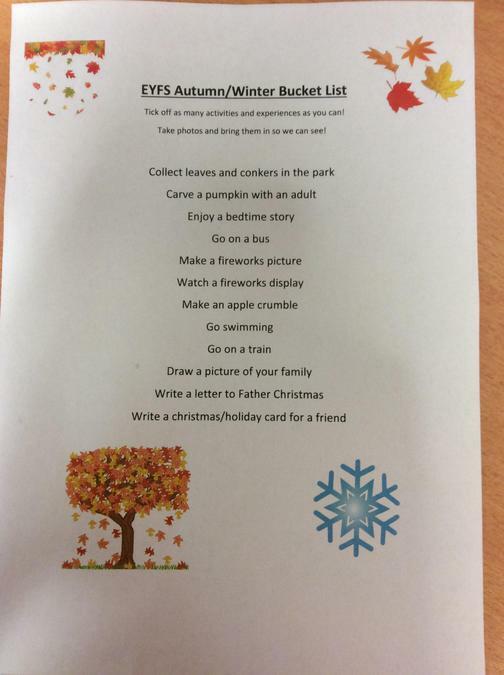 Don’t forget to complete some activities on the EYFS Autumn/Winter bucket list! Bring some photos in to show your child’s class teacher! Literacy Games Lots of Phonics games for you to enjoy! Maths Games Have fun playing number and shape games! Learn how to count in 1s to 20, 5s to 50 and 10s to 100! 1. How do I speak to the School if I have a concern about my child? 2. How will the SENCo ensure the necessary people know about my child’s needs? 3. How will my child’s progress be reviewed and when will I be invited into school to discuss this? Will my child be able to give their views? 4. How will the school know if my child needs extra help and what can parents do if they feel their child may have SEN? 5. How will the SENCo ask for my permission to involve other professionals to work with my child? 6. How will I be involved in all decisions and have my views listened to? 7. How will my child be involved in decisions about their learning? 8. How will I be given support in contacting organisations who can give me advice and support? 9. How will my school ensure that parents and children with additional needs are fully included in all school activities? 10. How will my school provide good teaching for my child and extra support when needed? 11. How are staff trained to support the needs of my child? 12. What types of learning resources are available for my child? 13. What resources does the school offer if my child has significant social and or communication needs? 14. What support is available if my child needs support with managing behaviour or dealing with social situations? What does the School Council do?